Ohio’s drug supply is getting much, much safer, resulting in a dramatic drop in overdose death in the Buckeye state. 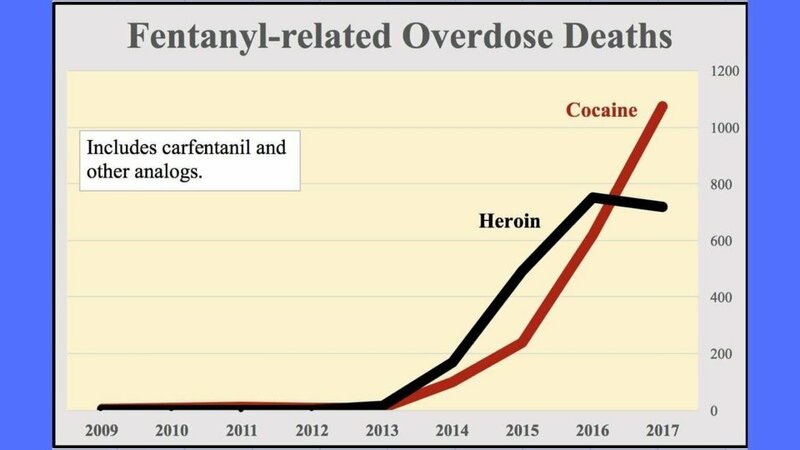 Fentanyl-cocaine mixes have plummeted from a high of 15.3% of all cocaine in June 2017 to just 2.9% of cocaine confiscated in August 2018. The reason for this remarkable decline in cocaine contamination — an 80% drop from its peak last year — is a mystery. The decline started in late summer of 2017 and has accelerated in 2018. The cost and availability of fentanyl and its analogs are unchanged. The illegal drug market appears to be responding to consumer demand for increased safety. The most important change in Ohio’s cocaine market is clear: carfentanil has nearly vanished from Ohio cocaine. It’s unclear why. At its peak in May 2017, carfentanil was found in 8.4% of Ohio cocaine. By contrast, in the third quarter of 2018 (July-August-September), none of the 814 cocaine samples confiscated in Ohio and tested in state crime labs contained cocaine and carfentanil. Carfentanil is an ultra-potent fentanyl analog that is too tiny for amateurs to mix safely into illegal drugs. 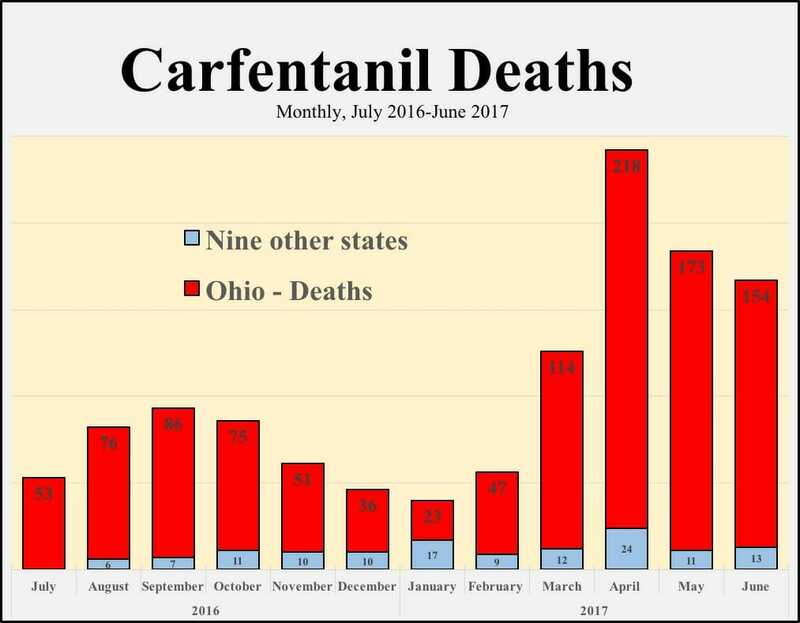 Carfentanil was involved in the overdose deaths of 1,100 Ohio residents from July 2016 through June 2017 and single-handedly .drove Ohio’s overdose death rate to No. 2 in the nation. In an unsolved economic mystery, carfentanil is leaving Ohio’s drug supply as fast and as suddenly entered in 2016. Whether it returns is unknown. 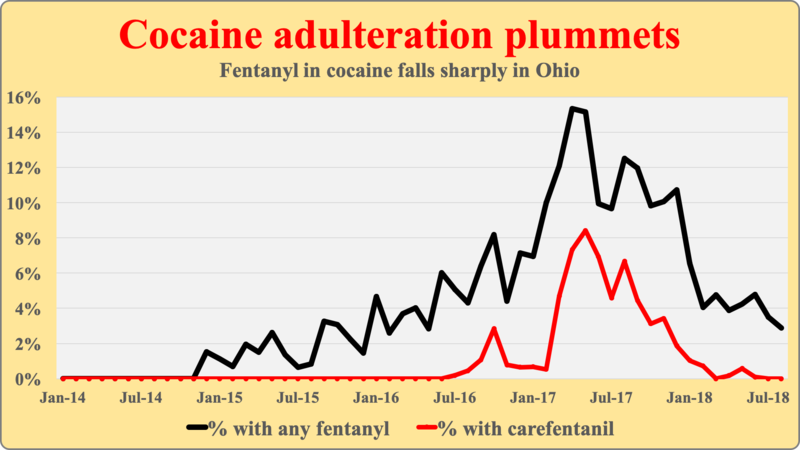 The adulteration of cocaine with fentanyl and carfentanil was the primary driver of an increase in overdose death, a fact that Harm Reduction Ohio reported more than a year ago while state officials continued to claim incorrectly that opiate use and heroin was the cause. The data in this report are based on Harm Reduction Ohio’s analysis of all drugs confiscated by law enforcement and analyzed since January 2015 at the four state crime labs (run by the Ohio Bureau of Criminal Investigation). The data set contains lab results (from gas chromatography–mass spectrometry analysis) on about 130,000 items seized from drug users and sellers in every Ohio county. Cocaine was found in 23,845 of the drugs tested by the BCI crime labs. 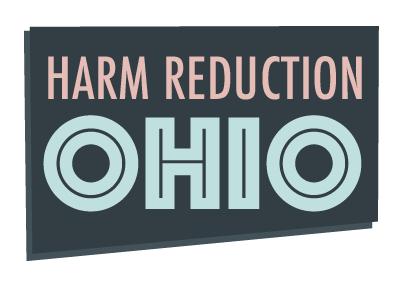 Harm Reduction Ohio’s analysis of the safety of the illegal drug supply is the only one currently available in Ohio or anywhere in the country. Levels of contamination are crucial information for understanding overdose death and making public policy. In addition, this information is highly valued by drug users who want to stay healthy and reduce overdose risk. Harm Reduction Ohio’s earlier stories on the portion Ohio’s cocaine and meth that is contaminated with fentanyl and its analogs have gone viral, generating tens of thousands of shares on Facebook, Twitter and other social media platforms. Why is Ohio’s cocaine supply getting safer? It is a fact that Ohio’s cocaine supply is safer and less contaminated than it was, although significant danger still exists. About one in 30 cocaine samples were found to contain fentanyl, meaning cocaine users can suffer an unexpected opiate overdose death. What’s unclear is why this change has occurred. Is it consumer choice? An intentional mix of a stimulant (such as cocaine or meth) and an opiate is called a speedball. It’s not clear how many cocaine-fentanyl mixes are intentional speedballs. 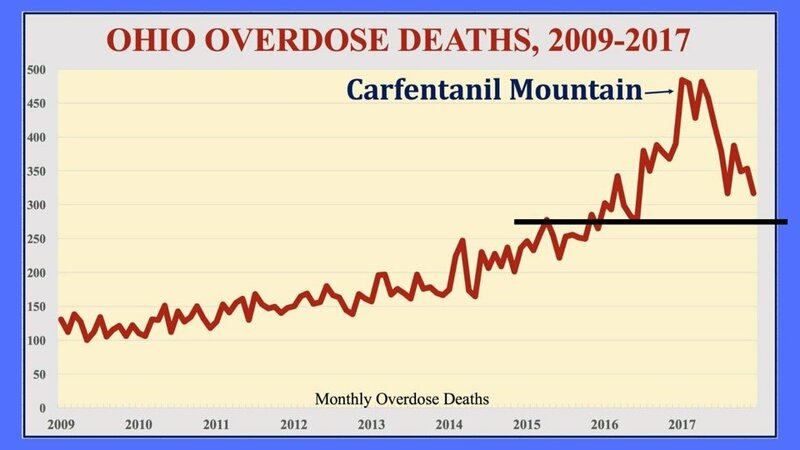 The departure of carfentanil is especially perplexing. The drug came to Ohio — but barely to other states — hard and fast in 2016. It appears to have vanished almost as quickly, for reasons unknown. Carfentanil’s devastation cannot be overstated. 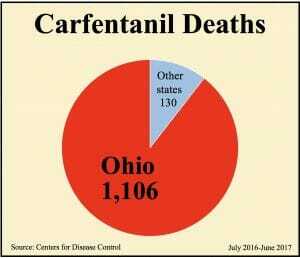 The pie chart above shows how carfentanil was largely an Ohio phenomenon. The numbers shown here are from a special CDC study, described here. The CDC examined overdose deaths in 10 states and found that Ohio’s carfentanil death rate was in a league of its own — 20x that of other states. 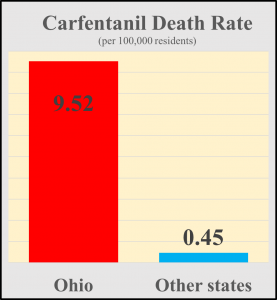 Bizarrely, the Ohio Department of Health has not acknowledged or even shown an awareness that our state was uniquely devastated by carfentanil. To get a sense of what happened, look at the carfentanil death rates from the CDC study. Then looked monthly pattern of Ohio carfentnail deaths versus those in other states, which had triple the population of Ohio. Finally, the chart below shows all overdose deaths in Ohio by month since 2009. The black line indicates what deaths would have been, roughly, if carfentanil had not come to Ohio. It also gives an indication of what death numbers may look like now, post-carfentanil.